We are coming from different places of the planet, co-exist with dogs and cats, creating relations of solidarity and freedom. This community, as its buildings is opened to the people through discussions in public spaces, projections, music events, café-bar, presentations of theories, and games with children. We have create structures for common use like library-reading space, compost on the Filopappou hill, public bathroom-laundry and free shop to exchange clothes, laboratory of conserves production and urban gardening. From the very start, we knew that freedom can be claimed only through struggle. 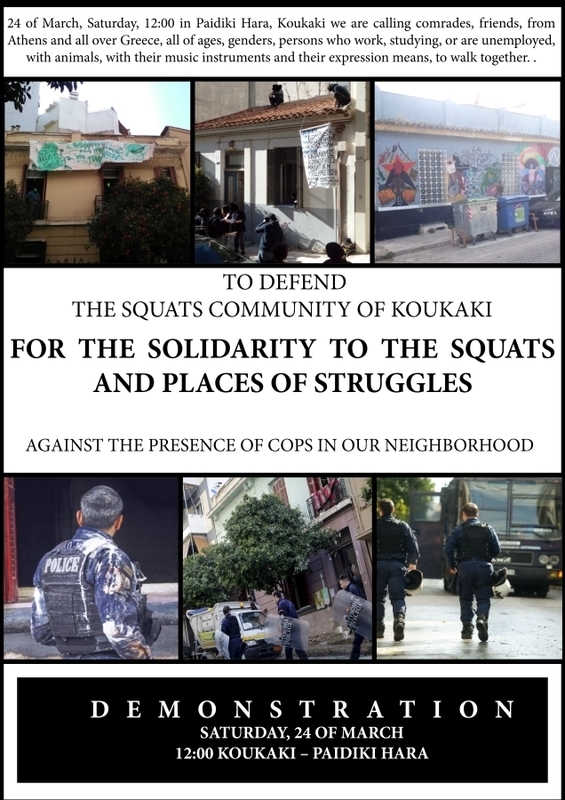 Our community is part of the anti-authoritarian/anarchist/libertarian movement and participates to the defending of the squats, in struggle against state repression, prisons and detention centers, against patriarchy, fascism, destruction of nature and stand in solidarity with migrants. Out of institutions, legality and capitalism extortions, our multi ethnic community gain grounds and became visible. As a result, the state and the fascists attacked us. 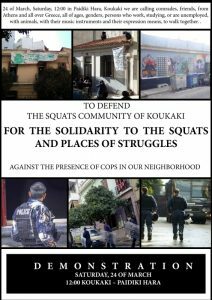 On February 21, fascists tried to burn the squat at Panaitoliou 21, attack unsuccessfully repeated on 14 of March. On 12 of March, at 6 o’clock in the morning, the full-equipped mercenaries invade the neighborhood, surround and evacuate the squat Matrozou 45, beat up and arrest all the people who were inside the house, seize personal and collective objects, setting up another court case. The operation of evacuation confronts a powerful resistance from comrades inside and outside the building. Meanwhile, people from the neighborhood try to interfere against the cops. Our resistance was a conscious political decision, it was the denial to submit ourselves to the violence of the state, it was a signal of struggle. The evacuation let behind a strong police presence in the neighborhood, while the media create another climate of terror. The state brought on fear which everyone must break out, by taking position against repression and its presence in our neighborhood. Our capacity to occupy buildings is a result of a struggle which is going on years now by a large and combative squatting movement where we also belong. For this reason the police operation was a coordinate attack. Alongside with Matrozou 45, the squats of Gare and Zaimi 11 were also evacuated. In this repression plan, fascists are playing a crucial, with their constant attacks to places of struggle, and at its summits the burning down of Libertatia. The list of attacks from the state and the fascists’ para-state is big. Even though, they remain unable to block the liberation. We are a part a social base that reflects its radical and anti-state characteristic. The uncompromisable struggles and libertarian cultures. We are caring another world, we will transfer it, defend it and claim it until the time it will be a reality. << Brussels: Demo march 21. A roof for everybody!